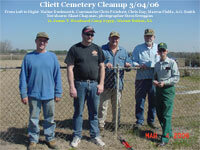 The Cliett Cemetery is located two miles west of I-75 on the Georgia 247 Connector (247C). It is situated on the north side of the 247 Connector across from the Peachtree Baptist Church and near the intersection where Barker Road meets GA247C. See map. It's located at Latitude: 32.606N; Longitude: -83.773W. SCV Camp 1399 maintains a Confederate Monument, flagpoles and a section of engraved memorial bricks on the cemetery grounds just outside the chain link fence. Memorial engraved bricks may be purchased from the Camp for $25; for details see the order form. A list of engraved bricks in place is below. 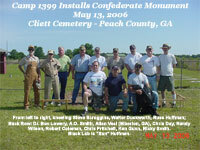 SCV Camp 1399 holds an annual memorial service at Cliett in honor of all Confederates and their families as well as the Confederate veterans buried there -- 7pm on the Friday nearest April 26th. The first was held April 28, 2007... and the most recent was April 25, 2014. 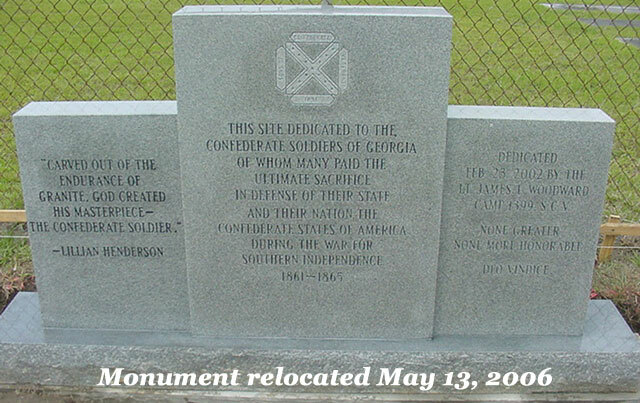 Despite temperatures near 100 degrees, well over 100 people gathered to dedicate a monument to Confederate soldiers June 24 near Powerville in Peach County. 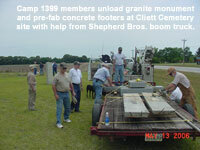 The monument represents years of effort by the Lt. James T Woodward Camp 1399 of Warner Robins. In addition to the monument, the ceremony unveiled over 110 engraved memorial bricks naming a variety of Confederate veterans and the units they served. Camp Commander Chris Pritchett welcomed everyone and former Commander Dr. Ben Lowery offered the opening prayer. Officers of Camp 1399 unveiled the monument. Pastor John Weaver was the special speaker at the event and the musical group Simple Heritage provided the entertainment with Dixie, Bonnie Blue Flag and several other selections. Members of the 10th Georgia and 16th Georgia re-enactors provided the honor guard to post the colors and fire a rifle salute. Refreshments were served after the closing prayer. Both the Houston Home Journal and The Macon Telegraph published stories on the event the following week.